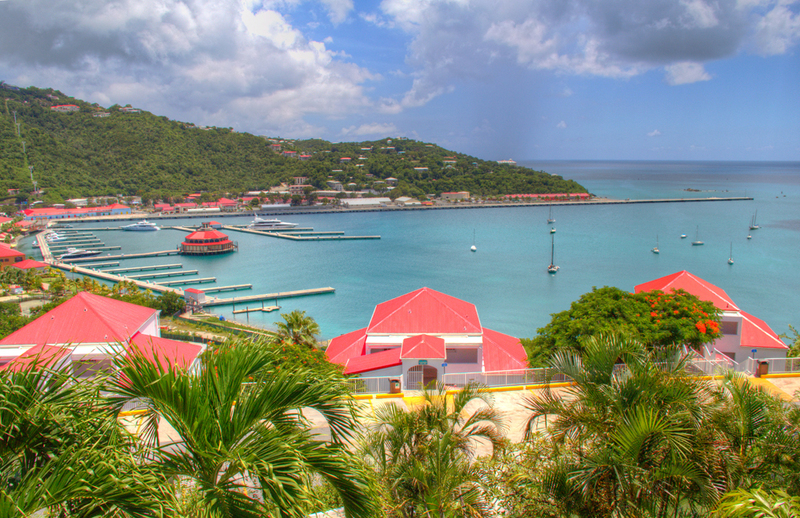 Get ready to step back in time for this month’s Resort Profile, as we visit Bluebeard’s Castle, located in the U.S. Virgin Islands in the heart of St. Thomas. Owners and guests check in at the former residence of the Danish governor of the island. The tower is believed to have been built around 1689 by the Danes who constructed it as a watchtower to aid in defending Fort Christian, and the centuries-old fortress bears the name “Bluebeard” after the fictional pirate. Today, the stone tower is surrounded by pristine accommodations, garden walkways and courtyards with the most scenic view on the islands. At one time, the turret was used as the honeymoon suite. While it is no longer used as a guest room, many distinguished guests have stayed there, including President Franklin D. Roosevelt. The renovations at Bluebeard’s Castle have been ongoing for approximately two years. The majority of the guest rooms have been completely gutted all the way down to replacing water pipes and electrical wiring behind the walls. These renovated units now have new furnishings, kitchen cabinets and hardware, countertops, double-burner electric cook tops, plumbing, and some have new full-size refrigerators and dishwashers. Extensive bathroom improvements have also been made. Living room work in these units included repair and replacement of drywall along with a fresh coat of paint to meet the specifications of the interior designer. The units were professionally decorated with new furnishings and coordinating artwork. To bring back the historic nature and flare of the island, some units have even been remodeled with new custom wooden shutters, as well. Televisions have been replaced with flat screens, and Wi-Fi access is now available resort-wide. New state-of-the art RFID Ving Card door locks have been installed on all unit entry doors, and new wall safes have been installed within each unit to provide for additional guest security. Some of the units on property were in a relatively newer condition, and did not need a complete interior renovation. These units received general maintenance repairs, new hot water heaters, water intrusion repairs, exterior lighting, fresh interior and exterior paint, and even received new hurricane shutters. The lobby has undergone a complete renovation, receiving a new roof, new data closet, check-in pods, interior and exterior paint, new window treatments and more. The furniture and artwork have been chosen to enhance the period of the original house. To assist all guests and to comply with local regulations, the lobby is also equipped with ADA bathrooms. The courtyard and common areas of the property have received new outdoor furniture and new landscaping. Bluebeard’s Castle has numerous accommodations options to meet a variety of needs, including studio and one- and two-bedroom suites. Amenities for all guest rooms include a private balcony, kitchen or kitchenette, microwaves, TVs and DVD/VCR players. Guests may reserve a room with either a king or queen bed. Those rooms with a second bedroom feature a king bed in the master bedroom, and two double beds in the second bedroom. All guest rooms have a kitchen or partial kitchen, and most have a sitting area. On the property, Bluebeard’s Castle features a pool with a bar, hot tub, children’s wading pool, three restaurants, concierge service to book tours or other activities, car rental reservations, activities, fitness center, laundry facility (with some laundry facilities in the rooms), convenience store, tennis and more. Management has launched a new website to take online reservations, and since Bluebeard’s Castle is a tourist attraction, they also try to market to those visitors coming onsite from the cruise ships or other tours, a great source of rental leads. The current economy has made management more open-minded to offering reductions on rental rates to meet supply and demand and to remain competitive. They understand that the consumer’s expendable income has dwindled, and that most people looking for a reservation or vacation are very Internet savvy. Consumers are willing to shop around and look for lower rates, so Bluebeard’s Castle has increased the utilization of online travel agents, therefore incorporating them more into their overall marketing strategies. Bluebeard’s Castle has become one of the most sought-after destinations in the Caribbean with beautifully landscaped grounds, newly renovated units, fabulous restaurants and views unlike any other. Situated on a secluded hilltop, this tropical paradise is the perfect place for a private getaway. It’s just a short drive from some of the most popular beaches in the area where owners and guests can enjoy boating, scuba diving, snorkeling, windsurfing and more. The island offers a wonderful assortment of duty-free shopping, world-famous restaurants, hot night clubs and a variety of local flavor to satisfy every taste. Bluebeard’s Castle is divided up into four owners associations, with most being timeshare. A portion of the villas are whole-owned units. Hilltop Villas, Hilltop Villas III, Villas I and Pirates’ Pension make up the four groups of owners. A recently formed entity, Great Vistas LLC, provides management oversight to the resort’s common areas. One representative from each of the four associations sits on this board. The staff understands the importance of providing an enjoyable, memorable vacation. There’s a team mentality there, and everyone pitches in when necessary. The resort was awarded the Silver Crown Award from RCI for achieving quality customer ratings for 2011. This is the first time in 10 years the property has received this prestigious award.